The Federal Parliament of Somalia (Somali: Golaha Shacabka Soomaaliya; often Baarlamaanka Federaalka Soomaaliya; Arabic: البرلمان الاتحادي في الصومال‎; Italian: Il parlamento federale della Somalia) is the national parliament of Somalia. Formed in August 2012, it is based in the capital Mogadishu and is bicameral, consisting of an Upper House (Senate) and a Lower House (House of the People). The tenth Parliament of Somalia was inaugurated on 27 December 2016. As part of the official "Roadmap for the End of Transition", a political process devised by former Prime Minister Abdiweli Mohamed Ali Gaas which provides clear benchmarks leading toward the establishment of permanent democratic institutions in Somalia by late August 2012, members of Somalia's then ruling Transitional Federal Government (TFG) and other administrative officials met in the northeastern town of Garowe in February 2012 to discuss post-transition arrangements. After extensive deliberations attended by regional actors and international observers, the conference ended in a signed agreement between TFG President Sharif Sheikh Ahmed, Prime Minister Ali, Speaker of Parliament Sharif Hassan Sheikh Aden, Puntland President Abdirahman Mohamed Farole, Galmudug President Mohamed Ahmed Alim and Ahlu Sunna Waljama'a representative Khalif Abdulkadir Noor stipulating that: a new 225 member bicameral parliament would be formed, consisting of an upper house seating 54 Senators as well as a lower house; 30% of the National Constituent Assembly (NCA) is earmarked for women; the President is to be appointed via a constitutional election; and the Prime Minister is selected by the president, who would then name a council of ministers. In a statement to the United Nations Security Council, Michael Keating, Special Representative and Head of the United Nations Assistance Mission in Somalia (UNSOM), noted that the Upper House of Parliament had come into existence, comprising 54 members chosen on the basis of federal member state rather than clan; the electorate had expanded from 135 male elders in 2012, to more than 13,000, 30 per cent of whom were women; and voting had taken place in six locations around the country, reflecting emerging State structures. The Senate, or Upper house, was elected during Somali parliamentary election held on 2016 and it contains 54 senators. In December 2014, the first Somali Youth Parliament was established. It comprises 275 youngsters between the ages of 16 and 30, who were selected from local universities. Members are tasked with spearheading national development initiatives. According to the Office of the Somali Parliament, sitting legislators are mandated to serve from 2016 to 2020. ^ a b "Somalia swears in 283 members of parliament". UNSOM. 2016-12-27. Retrieved 2017-01-30. ^ Ahmed, Muddassar (8 August 2012). "Somalia rising after two decades of civil war and unrest". Al Arabiya. Archived from the original on 2012-08-09. Retrieved 9 August 2012. ^ a b c d e f "Somalia swears in historic new parliament". Al Jazeera. 20 August 2012. Retrieved 21 August 2012. ^ "Somalia's newly-endorsed constitution widely hailed". Xinhua. Archived from the original on 7 October 2013. Retrieved 2 August 2012. ^ "Somali leaders back new constitution". BBC. 1 August 2012. Retrieved 2 August 2012. ^ a b c "Somalia: List of new parliamentarians leaked". Archived from the original on 2012-11-22. Retrieved 2012-08-24. ^ a b "Somalia: Committee excludes warlords, rebels and armed groups from Federal Parliament". Archived from the original on 2012-08-18. Retrieved 2012-08-24. ^ "Election of New Parliament 'a Milestone' in Somalia's Post-conflict Transformation, Special Representative Tells Security Council". ReliefWeb. 2017-01-27. Retrieved 2017-01-30. ^ a b c "Office of the Somali Parliament". Office of the Somali Parliament. Archived from the original on 2012-07-14. Retrieved 24 August 2012. 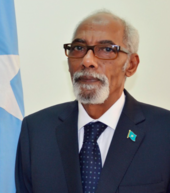 ^ "Somali Parliament Elects Speaker for New Gov't". Voice of America. 28 August 2012. Retrieved 28 August 2012. ^ Mohamed, Mahmoud (29 August 2012). "Somalia successfully concludes first elections in over 20 years". Sabahi. Retrieved 30 August 2012. ^ "The Federal Republic of Somalia - Harmonized Draft Constitution" (PDF). Federal Government of Somalia. Archived from the original (PDF) on 2013-01-20. Retrieved 2 August 2012. ^ "Guidebook to the Somali Draft Provisional Constitution". Archived from the original on 2013-08-14. Retrieved 2 August 2012. ^ "Parliamentary interior committee". Goobjoog. 2 April 2014. Archived from the original on 7 April 2014. Retrieved 3 April 2014. ^ "April 12-13, 2013 - Preliminary Program" (PDF). McDonough Leadership Center. Retrieved 2 April 2014. 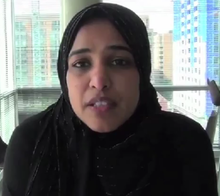 ^ "Hodan Ahmed". National Democratic Institute. Retrieved 2 April 2014. ^ "Tenth Parliament of Somalia". Retrieved 17 January 2017. ^ "Benadir administration welcomes the formation of national youth parliament". Goobjoog. 15 December 2014. Retrieved 15 December 2014. ^ "Committees". Federal Parliament of Somalia. Archived from the original on 22 October 2014. Retrieved 27 October 2014. ^ "Somali Cabinet Ministers agree financial management committee to work temporarily". Goobjoog. 19 March 2015. Retrieved 21 March 2015. ^ "The Federal Republic of Somalia - Provisional Constitution" (PDF). Federal Government of Somalia. Archived from the original (PDF) on January 24, 2013. Retrieved 16 September 2012. 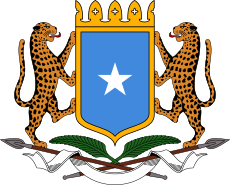 ^ "Somalia (House of the People)". Inter-Parliamentary Union. Retrieved 6 September 2013. This page was last edited on 30 December 2018, at 04:28 (UTC).